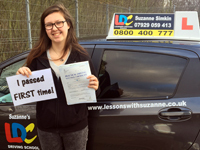 I have had the pleasure of teaching Charlotte from the beginning right through to her fantastic, first-time pass. Despite some difficult events in her life, she persisted throughout and I can’t wait to see what kind of green car Charlotte buys and this will enable her to achieve her other life ambitions. I could not have had a better instructor! She has the patience of a saint and is an all round lovely lady! Thank you so so much for helping me pass first time! 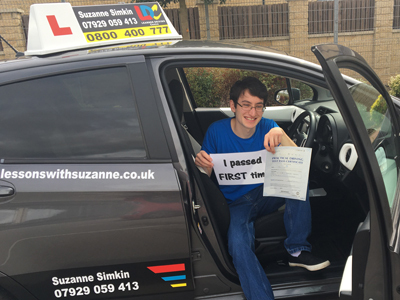 I am very proud of the way Tom kept his cool and earned himself an amazing pass with just one fault! I have taught him from day one, and it took him a few attempts to keep nerves at bay on test, but when he did, what a result!! During my time learning with Suzanne, I was made to feel comfortable and at ease, even through what, for me, was a nerve wracking experience, due to my anxiety. She was always conscious of this, taking my feelings into account and planning my lessons based around how I was coping that day. Her lessons were always well explained, in a calm and informative manner, even when things didn't go as well as I'd planned. This helped to alleviate any nerves I had when trying a new manoeuvre, or technique. We worked to my abilities, and it was always my choice whether we moved on to something new, or continued to hone the basics. She was always aware of my lack of self confidence, and worked to build on that throughout my lessons. She took to this with a kindness and thoughtfulness that I doubt I could have found easily elsewhere. 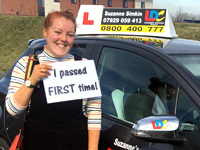 I don't think I could have passed first time without her, and I am so pleased that I chose Suzanne as my driving tutor. 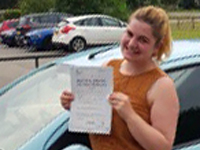 Cat passed first time with a fantastic record of only three minor faults. She only started lessons with me in September, never having learnt before, and did a brilliant job of mastering everything so quickly. It was a pleasure to work with her! 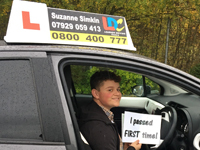 I was delighted that I was able to pass the test first time. Before we even began, Suzanne outlined the pros and cons of the one week pass course compared to the other choices availible. Due to my own circumstances I really had no choice but to select this course however the fact that Suzanne broke down the courses gave me more belief that she was invested in myself as a learner and not just another means of making money, which I have had previous history of with other companies. The LDC franchise has a really good learning programme focused on module based learning rather than a check list of driving elements. In my case, due to my endless questioning of my abilities, it was reassuring that Suzanne allowed me the freedom to revisit and refine areas I felt I was lacking in, although she did help to push me on when I was ready for the next steps. As a student who had previously done hourly sessions verses a combination of 2, 3 or 4 hour blocks that I did this time around, I can see the benefits and hindrances of both timetables. Shorter hours places less stress on the learner however the longer blocks allow yourself to retain more of the techniques and become more familiar with the car. 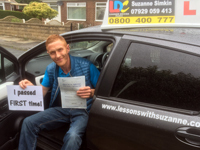 Personally I was a nervous wreck and if it wasn't for Suzanne's calming and positive nature I don't think I would have passed. Suzanne was an absolute pleasure to learn from, her qualities as a teacher allowed me to enhance my understanding of the information outlined in the LDC handbook/disc and her unwavering ability to stop me from underestimating myself establishes that she cares for the learner foremost. All the plaudits go to this great instructor and I have no qualms regarding recommending her to other learners. Thank you Suzanne for all your hard work. Best wishes for the future. First time pass after only 28.5 hours of lessons! 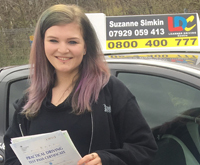 I chose Suzanne upon recommendation from a friend of the family who’d passed first time with her, and what a good choice it was! Brilliant teacher who put in as much effort as me and made sure I was happy and confident with everything I had learnt. 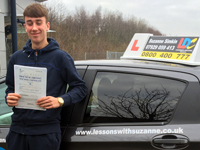 Using Suzanne I was able to pass my test first time after only 10 lessons! Highly recommended. Dom worked really hard using the LD system, studying between each lesson and applying all he learnt. He really earned his pass! Held her nerves at bay for a great pass! I taught Amy from her first steps as a driver. She has never found easy to believe in herself or her abilities. The testing process was a very anxious one for Amy, so I was so very proud when she held her nerve on her third test and got the pass she deserved. She only got six minor faults and all these were errors of nervousness. Amy is a great driver and I am thrilled she has got her licence to prove it! Amy wrote: Thank you Suzanne for all you’ve done! You believed in me more than I did myself. Who knows might be my next move! Thank you! I’m VERY happy! 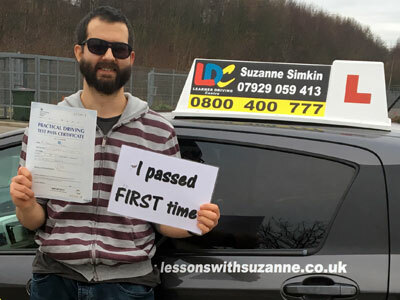 I started lessons with Suzanne after having an unhelpful time with a "pass in 5 days" course with another company last year. I already had my theory, but it had been a long time since I had done any driving. Suzanne has a very patient and organized personality, which I found very helpful and calming as I was learning to drive! At the start of each lesson, she will go over what happened during the last lesson and discuss any points that need discussing and reminding, and then she will ask you what YOU want to do during this lesson, whilst giving you pointers and guidance. This means that you will always be doing something that you feel you need to be doing and that you want to be doing that day, rather than being told what to do each lesson. During the teaching, you will usually be talked through exactly what you need to do and what you need to look out for whilst at the side of the road, allowing you to be clear about the process or the manoeuvre before you even attempt it. You will then go ahead and complete the manoeuvre, and pull over again and review afterward. This instant feedback whilst it is still fresh in both minds is very useful for improvement! This also means that during the driving, you can focus on the road and the task ahead, instead of having to split attention between the road and listening to instructions. I always felt very at ease when asking questions with Suzanne, and was encouraged to do so, which again allowed me a much quicker understanding of a lot of key concepts. When you first have lessons with Suzanne, she will provide you with a login for LDC's online systems, and an LDC workbook. These are high-quality materials, and the workbook especially goes into depth about the exact criteria the examiners are looking for in each category and gives the exact wording to all the "show me tell me" questions which I found incredibly useful! The LDC website will have a record of every lesson you have with Suzanne, and also has a lot of useful videos about driving, although a lot of these can also be found on youtube too, which will give you an idea of the quality of LDC materials. 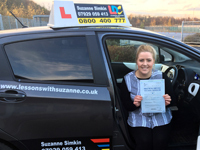 I would thoroughly recommend Suzanne to anyone, her calm approach and student-focused style is a multitude better than my previous instructor's style of bombarding me with too much information by yelling stuff whilst I was in the middle of a roundabout! Her honest and accurate feedback at the end of every lesson lets you see and measure your progress, and see how close you are to becoming ready for the test. Her punctuality is great, arriving 5 mins ahead of every lesson. Her car is clean and comfortable to drive. Thank you Suzanne for getting me my driving licence! 5 stars from me! Passed first time, with three minor faults and a compliment! Review Matt Thank you Suzanne was an excellent week. You drilled it into me all week. I'd recommend you to anyone. Many more passes to come. Can’t thank you enough! I'm really pleased! Thanks!! I chose to go ahead with Suzanne after reading a recommendation on Facebook which highlighted her patience and friendliness. When I contacted her she was more than happy to discuss options and had some great deals on too. She has seen me through theory to practical. Not only have I now gained a driving licence but I had fun doing it. She is friendly, kind, and inspiring. I was given workbook which was really helpful and allowed me to be part of the lesson structure. I would highly recommend her services, especially for nervous or shy people because her natural personality puts people at ease. I'm so grateful for your help Suzanne. Thank you.